There’s so many things wrong with the thinking in that quote above... Nothing, and I mean nothing, compares to homemade. Sometimes you just have to have homemade cake. I’m old enough to admit that. It’s sad that the craving usually hits in the evening – and at times when you don’t have any in the house. Pink batter. Like a party in a pan. It’s also kind of sad that what passes for cake at the grocery store really isn’t. Well it IS, but most certainly doesn’t hold a candle to homemade. Cake should make you mumble “mmmmm,” not make you wonder at every bite what was substituted instead of butter. I find grocery store cake light and fluffy. Too light and fluffy. “Airy” would be a word to describe them. That’s not good. A decent cake should have some substance. So going to the grocery – usually one of my most favourite pastimes – was out. Cake from a box is nearly as bad. If I had gone to the grocery store I would have picked up a pound cake. By this time I really wanted some. A good pound cake is a delight to behold. 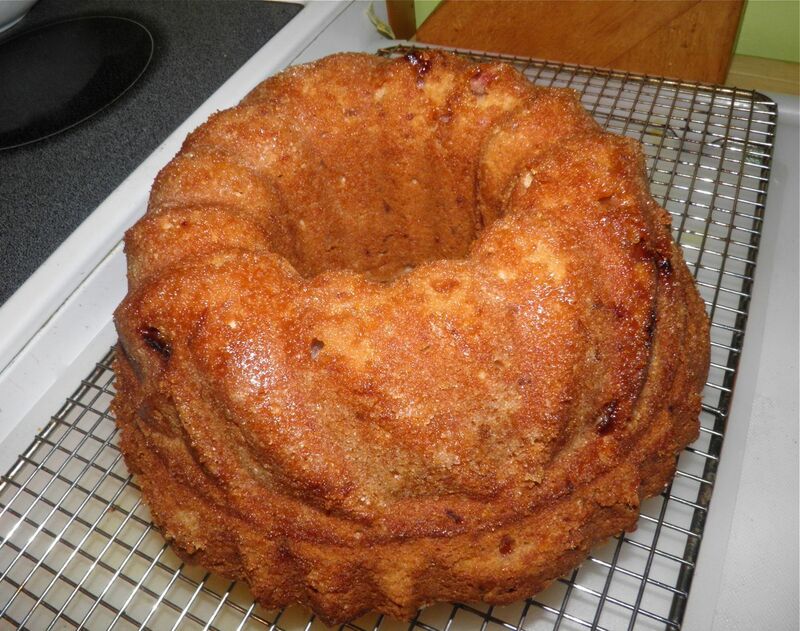 Pound cake’s name originally came from its ingredients: 1 pound each of sugar, flour, butter and eggs. Of course that makes pretty large cake. For example, there’s about 8 large eggs in a pound. Calculating from that, a true pound cake would make one twice the size of this recipe. In France pound cake is called “quatre-quarts” (four quarters). The name means that all four ingredients are included in equal weight, so you don’t really have to stick to a pound of each. As long as you have a 1:1:1:1 weight ratio of each ingredient you will end up with a pound cake. Many recipes don’t even call for salt or vanilla. I took a basic pound cake recipe and made some additions, based on what I had to work with in the house. I had some frozen strawberries and oranges hanging around, so in they went. The flavours work extremely well together. Making a cake in the evening can be a little time consuming, especially waiting for it to bake. But if you get your craving soon enough after dinner you’ll be drinking milk and eating cake in no time. You'll notice the recipe calls for frozen strawberries. You could use fresh, but I;'m not sure it would turn out quite the same. 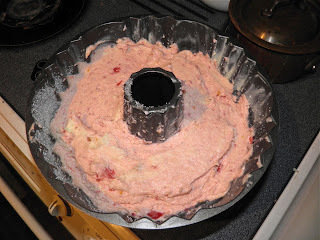 The frozen berries kind of disappeared into the batter. Pieces that were larger ended up being a little like jam in spots. Nice. I don't think fresh berries would do that. Dusting the cake pan with sugar is a good thing to do. The finished cake comes out with a sparkly, almost sugary-crunchy exterior. A little about Bisquik (regarding the intro quote): It was first "discovered" by a travelling sales executive from General Mills in 1930. While on a train trip he asked the rail line chef about his wonderful biscuits. The chef said he used a pre-made mixture of flour, lard, salt and baking powder – that he kept on ice. So back to the pantry we should go. Preheat oven to 325°F. Butter a 10-inch bunt pan with 2 tablespoons of the butter. Dust the inside with 6 tbsp of sugar. Set aside. 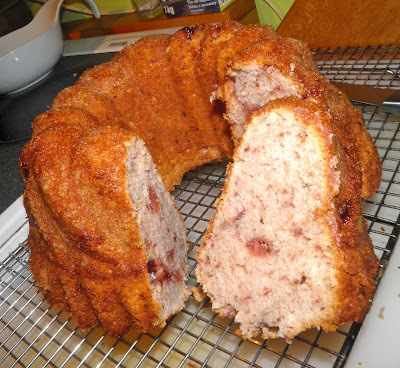 Toss the strawberries with 1/4 cup flour in a bowl and set aside. Beat together the remaining butter and sugar in a mixing bowl until light and fluffy. Beat in the eggs one at a time. Then add the baking soda, vanilla, orange zest, juice and salt. Add the remaining flour, 1/2 cup at a time until all is incorporated. Stir in the strawberries. If you wish to have a pinkish cake, vigorously stir the berries to break them up slightly in the batter. Spoon the batter into the prepared pan. 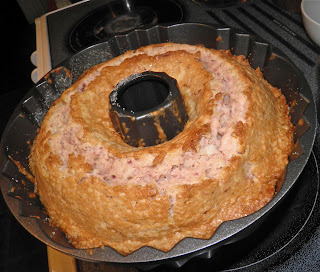 Bake for 1 hour 10 minutes to 1 hour 20 minutes, or until a cake tester comes out clean and the top has split characteristically like a pound cake. Remove from the oven , let cool for 10 minutes and then invert onto a wire rack.